Sole Bay 35 with gaff main sail and mizzen, a Ketch rigged motor sailer, designed by J. Francis Jones. 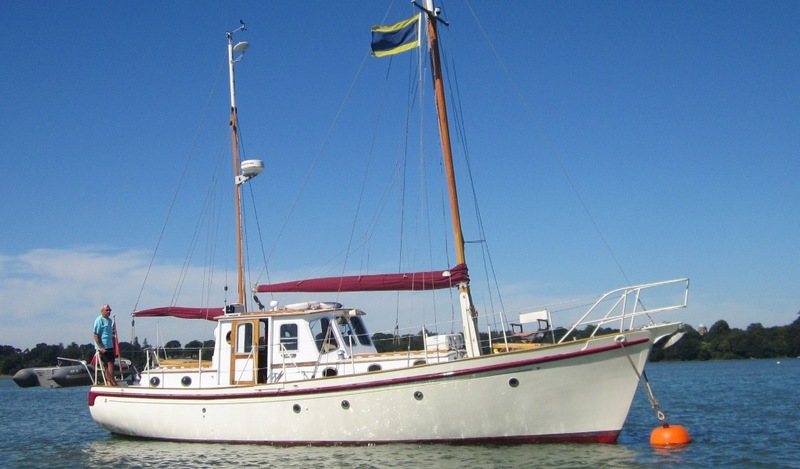 Built in Wroxham, Norfolk. Carvel planked of Iroko on Oak. Mahogany topsides. Decks and coach roof Cascover sheathed and painted. She is a fine example of her class. 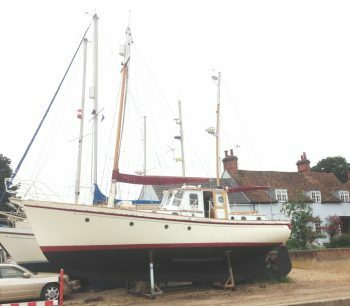 She is presently out of the water for the Winter. Sails and spars also in covered storage. Her layout gives space and privacy for 2 couples or a family. She would work well for extended cruising. 2 x heads, 1 x shower unit. Sail Wardrobe: Gaff main sail. Jeckells. mizzen. Jeckells. Genoa.B & H. Jib. 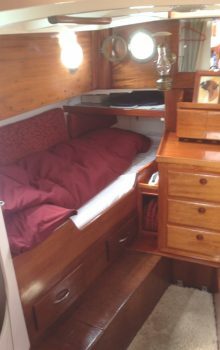 B & H.
Sleeps 6, 2 x single berths in the aft cabin, 2 x in the saloon forcastle pipe cot and a pilot’s berth in the wheelhouse. Upholstery covered berth cushions. Flotex carpeting throughout. small folding occasional table for the wheelhouse. 2 x Lavac toilets and wash basins, one in the en suite aft and one in the fore peak. Shower tap arrangement with a drain in the aft facilities. Step down forward from the wheelhouse into the galley area. 2 burner Plastimo 2000 cooker with grill and oven, 2 x gas bottles. 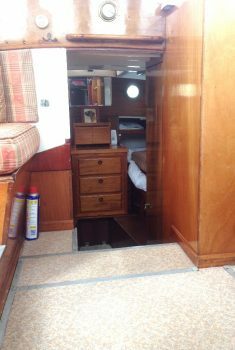 Port side is the galley sink and stowage. Crockery,utensils, glasses etc included. Electrolux RM 212 fridge is housed in the aft cabin with a false door front appears as a set of drawers. 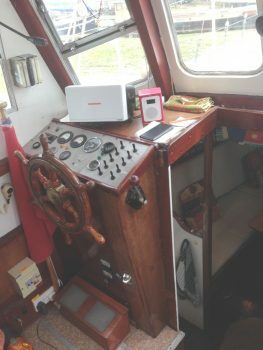 In the saloon there is a Sailor Type 66 TMF receiver and a car radio cassette with 4 speakers. Opposing settee berths with stowage behind and beneath. A central fixed varnished table. A very cosy and comfortable saloon. Loads of stowage lockers throughout. A very well turned out vessel. Electrics: 4 x heavy duty batteries 110 amps own master switches and charged by two different alternators, 2 x shore power chargers, 12v cabin lighting throughout. Safety Equipment: 6 man valise life raft EPIRB (hired). Automatic fire extinguisher in the engine room, plus 3 foam filled ones in the cabins. Distress flares 3 x ventilators and an electric extractor fan. 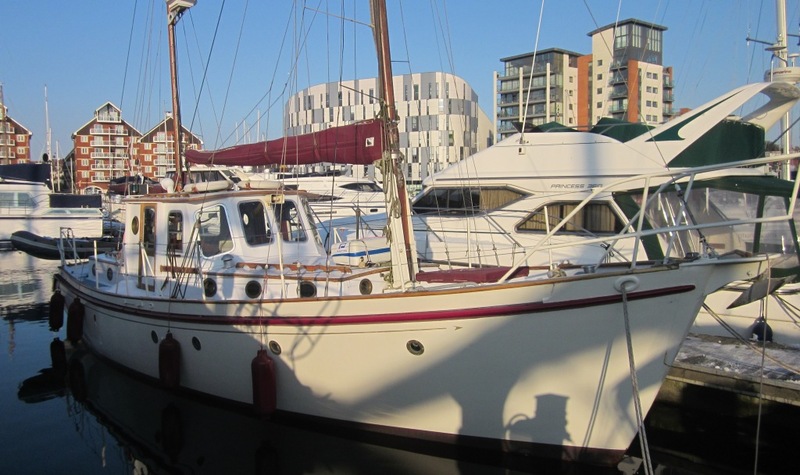 Lifelines on deck, stanchions with guard wires (3 gate exits from side decks and the transom) emergency tiller and galvanised pulpit. Manual bilge pump, automatic bilge pumps x 2 of. 2.8m Avon Rib hanging in davits with 5hp Mariner outboard, Radar reflector, Gas sniffer fire blanket, 6 x life jackets, 2 x life rings one with light one with heaving line. Self draining gas locker on deck. Tankage: 80 gallon capacity fuel, 80 gallon capacity water glass sights for indicators. Water System: Pressurised hot and cold water systems. Cold water also gravity fed. Rimai RE-58E gas water heater. High powered sea water deck hose. Hull Material: Wood, carvel planked, Iroko on Oak. copper tingle starboard side. Metal painted stem band. Transom stern with transom hung rudder.